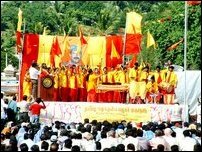 Tamil speaking people in large numbers from north, west and south of the Trincomalee district attended the Tamil National Resurgence Convention held Saturday morning in the Playground located along the Inner Harbour Road in the east port city which is controlled by the Sri Lanka Army. 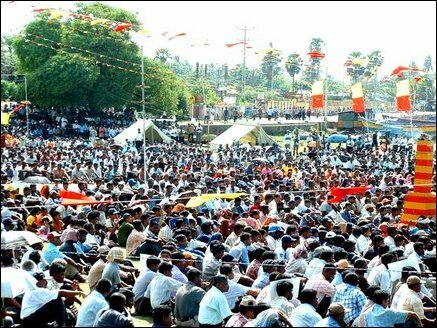 Co-ordinating Committee of the Tamil national Resurgence in Trincomalee District, in the declaration, demanded the Sri Lanka troops to vacate the NorthEast land and seas and declared that the rally "demonstrates to the international community the thirst for freedom of the Tamil nation." Mr.K.Sivapalan, Attorney-at-Law and a human rights activist read out the Declaration of Tamil Resurgence Convention around 1:00 p.m. while thousands of Tamil people, men, women and students including several TNA parliamentarians stood and took oaths. Brammasiri S.Ravichandrakurukkal, Venerable Nandaretna Thera, Chief Incumbent of Mahadiulwewa Raja Maha Vihare, Rev.Fr.C.V.Annathas and Mr.A.H.Sahul Hameed also lit the flame of sacrifice and blessed the occasion. No police and army personnel were seen at the site of the convention. The vehicular traffic along the Inner Harbour Road was diverted at two points- Orr's Hill central junction and the other at Sea View Road junction- by the Trincomalee Police as a security measure. However, the Senior Superintendent of the Sri Lankan Police reacted to the hoisting the Thamileelam national flag at a venue which he said was a "state property". Monitors of the Sri Lanka Monitoring Mission (SLMM) based in Trincomalee led by their head Mr.Arthur Tveiten were present monitoring the situation. SLMM Monitor Tveiten said he handed over the complaint receivedd from the Lankan Police to Mr. R. Sampanthan, TNA leader, and he was waiting for the response. Mr.K.Thangarajah, Convention Committee Chairman presided. Cultural event was also held. Parliamentarians Messrs K.Thangeswary, K.Pathmanathan, N.Raviraj, K.Thurairatnasingham, Selvam Adaikalanathan and R.Sampanthan and several others spoke. Mr.N.Sriskandarajah, Secretary of the Convention Committee proposed vote of thanks. After a half century since the independence of the Sinhala nation, Sinhala Buddhist chauvinism has shut all the doors to a democratic and peaceful settlement of the problems of the Tamil speaking people. In this context, we the Tamil speaking people inhabiting our traditional homeland are forced to place our desperate and perilous plight before the international community. We the Tamils had our own Government in this Island before the European invasion. The British Government forced upon us the unitary form of Government for their colonial administrative convenience and annexed the Tamil Nation to the Sinhala Nation. When the British quit this country in 1948, they handed over the governance to the numerically majority Sinhalese. Thus after improperly acquiring the governance of the country, the Sinhala race used their numerical majority to mistreat and oppress our people. Citizenship legislation was enacted to disenfranchise hundreds of thousands of plantation Tamils. With the 'Sinhala Only' legislation, Tamils were deprived of their rights to language and employment. Emergency regulations and Prevention of Terrorism Act, as they are applied even today during the Ceasefire Agreement period, furthered the complete denial of Human Rights of the Tamils. Through systematic State sponsored colonization our traditional habitations were taken over by the Sinhalese adversely altering our demographic distribution and right to life especially in the East and more particularly in the Trincomalee District thereby making it impossible for Tamils to live in peace even in their own town, chosen by Tamil speaking as the Capital of the Tamil Nation. Against such oppression and discrimination the Tamil leadership of yester years protested with peaceful non-violent political campaigns. Although as a result of it, Agreements such as "Banda-Chelva Pact 1957", "Dudley-Chelva Pact-1965" were entered into, they were both abrogated unilaterally due to the Sinhala Buddhist extremism led by sections of the Buddhist monks and Sinhala opposition party leaders. The 1972 Republican Constitution and the 1978 Constitution with the Executive Presidential system were introduced without the participation or ratification of the Tamil people or their elected representatives, retaining Sinhalese as the Official Language of the country and making Buddhism the foremost religion of the State paving the way for racial and religious discrimination. The Constitution that should serve justice became the embodiment of injustice. Considering the futility of winning over their rights and realizing that there was no Sinhala Statesman who will rise to the occasion and bring about a solution, the Tamils passed the Vaddukoddai Resolution on 14th May 1976 and on overwhelming Mandate was given by the people of the North-East in the 1976 Parliamentary Elections through ballot foe secession. The majoritarian Sinhala State continuously brutally crushed the just struggle of Tamils using their armed forces composed almost entirely of the Sinhalese. Due to this the Tamil youth were forced to take up arms to ensure the protection of Tamil speaking people. It was as a result of the armed struggle by the LTTE under the able guidance of our national leader that the State came down to start the peace talks under the facilitation of the Norwegians. 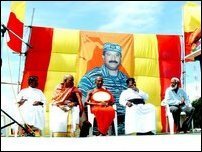 Three and a half years of cessation of hostilities, brought about in order to find a solution that will meet the just aspirations of the Tamil speaking people is being used by the Sinhala chauvinistic forces to further oppress and weaken them and to fortify their intransigent position. 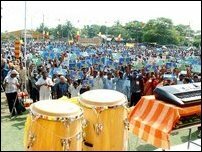 In this difficult situation, the Tamil resurgence Day is taking place in Trincomalee. With State colonization continuing, all the rights of the Tamils being denied and racial discrimination continuing, Tamil speaking people in their traditional homeland have gathered in numbers to show their feeling against such blatant oppression. The main objective of this Trincomalee Tamil National Resurgence Day will be to demonstrate to the international community the thirst for freedom of the Tamil nation for over half a century. It would also urge the international community that they should not yield to the deceit of the Sinhala chauvinist governments and other forces. 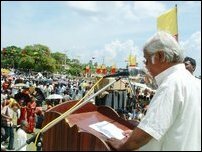 Tamil speaking people desire to show their opposition to the action arbitrarily taken against the LTTE by the European Union without indictment, trial or judgement-the essential elements of the Rule of Law, under the Chairmanship of the British who have for years reaped the benefit of the Trincomalee Harbour and Naval Yard by its occupation. We therefore urge the European Union to be realistic, if they want to change the situation that has been created by the extremist forces on the ground against peace, and consider lifting their stand that LTTE delegations will not be welcomed to their member countries. Wherefore we demand through this Declaration that the occupying Sinhala Armed Forces do vacate our land and seas with immediate effect. We proclaim that an environment should be created to enable us to decide our destiny in our land on our own strength and for our people to continue to rise as a formidable force to procure the goal of a sacred and higher life of freedom. Whilst making the above Declaration, we seek the recognition by the international community of our basic rights and life of freedom with peace on the basis of our traditional homeland, our nationhood and self-rule and struggle for sovereignty.